Diz, Namine', Relix(unconcious), and the hooded man arive in the mansion in Twilight Town. The hooded man sets Relix down gently next to a chamber where his memories are to be erased. "Relix is going to have to start this all over again. Erase his memory Namine'." "His memories?!? You said all he had to do was bring Serenity to you not become your puppet!" "He is a nobody. Nothing more if to serve me he has to be a puppet..so be it." "He's not just any nobody. He's a half nobody, there for half somebody. He doesn't derserve to become your puppet...use me." "Haha! Very touching witch. But it the fact that makes him a half nobody that makes him perfect for my minnion. He can travel in light and darkness. something you can't ever acomplish. Ansem get rid of her." (Hooded man) "With pleasure." Relix finds enough strengh to summon his keyblade and hit the man. "Back..uhh...o-off." "Ahh so he lives. So I dont have to repeat myself. Ansem take them both to the room." The hooded man hit Relix and took Namine' and Relix to the basement and locked them up. Relix begins to bang on the doors and walls. "Let us OUT!!! OPEN the DOOR!!! DIZZZZ!!!!" "shut him up." (the hooded man goes to the basement chaging a dark energy ball. He opens the door and shoots Relix. hitting him acroos the room.) "Sit down and behave like a good little boy." "Relix...I'm so sorry. I got you into this mess. It wasn't supposed to be this way. He said..." Namine' then begins to cry and drops to the floor. "Don't blame yourself DiZ tricked you. Just like he did to me." Relix then thinks of Riku's face before he went through the portal. Relix then gives a weak laugh holding his side where he got hit. 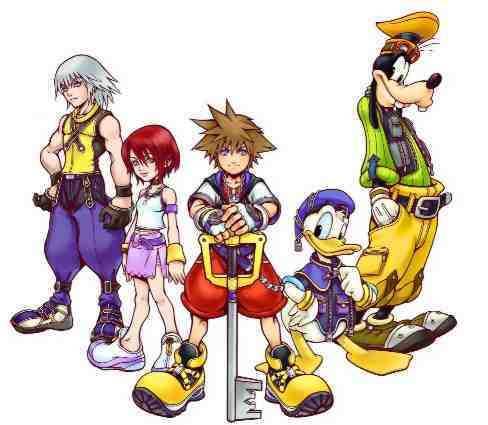 (sad song plays) "I don't think Riku will come get us. I sort of betrayed his trust." relix then pauses for a while and looks worried. "I don't have a plan for this one. I guess DiZ did win. He did say betraying him was unforgivable. He said he would win. Guess..he was right." "Relix...you can't give up...you have to keep practicing fighting me..."
Relix then charges a Aroura Shpere. "Let...us...OUT!!" Relix then blows the door down. "Namine' run! Go find Riku!" Namine' then runs out of the building and into Twilight Town. (hooded man) "What good would that do? She'll just get captured by the Organization. And-" "-She won't be able to erase my memory. Sorry DiZ you lose. I don't win but at least...you dont either." Riku flips out of nowhere and he attacks the hooded man. "Relix...I'm still very mad at you for betraying us...and your still getting it after I'm through with him...but I like that you didn't give up..." Riku attacks the hooded man faster than the eyes could see. (Hooded man) So Riku, you've decided to turn on what you've become..." (Riku) "Shut up...I'm not like than anymore..." (Hooded man) "So you think you CAN do it?" (Riku) I know I can..." Riku started attacking once again. "Fine Riku. I exspected as much. I'll go after DiZ. You can do what you want with me after that." Relix then limps to the other room where Diz was awaiting Relix and Riku. "Well...if it isn't Riku and Relix, you have escaped I see." "You've lost DiZ, give it UP!" Relix says wielding his Wat To Dawn. "Have I? Tell me Relix what do you acomplish from eliminating an old man no one knows? Nothing. Escaping a man no one knows? Nothing. But if I were to eliminate you all the worlds will know, all the people you came in contact with. YOU have lost Relix not me." Relix looks at the floor and gives a slight laugh. "Who said I was going to tell anyone?" DiZ then sees Riku following. "Riku...you help this poor pathetic person? What in your heart allows you to show such mercy? He is not worth saving." DiZ then looks at Relix and laughs at him. "You truely are a nobody." Relix looks at Riku and again feels regret. "S-Shut up. I tear that mouth of yours off! Take..it...BACK!!!" Relix charges at DiZ trying to behead him. "You're wrong...Relix...I am sorry for snapping like that...and DiZ he is no nobody.......if he was a nobody, he wouldn't have made it this far..." Riku puts his hand on Relix's shoulder. "Don't waste your time on DiZ...he will get what's comming to him...leave him be and find the rest of Organization XIII...then we can come back for him later...." Riku walks out the door leaving Relic to decide. Relix thinks about what Riku told him. Relix clutches his fist then relaxes a bit. "I'll let you live. For the time being but when that time comes..." Relix then starts for the door. He looks back at DiZ and turns away in a heavy-hearted face. "You were a father to me...I never knew we would become like..this." Relix then leaves and doesn't look back this time.